NEW HAVEN – Once again, the Chinese economy has defied the hand wringing of the nattering nabobs of negativism. After decelerating for six consecutive years, real GDP growth appears to be inching up in 2017. The 6.9% annualized increase just reported for the second quarter exceeds the 6.7% rise in 2016 and is well above the consensus of international forecasters who, just a few months ago, expected growth to be closer to 6.5% this year, and to slow further, to 6%, in 2018. I have long argued that the fixation on headline GDP overlooks deeper issues shaping the China growth debate. That is because the Chinese economy is in the midst of an extraordinary structural transformation – with a manufacturing-led producer model giving way to an increasingly powerful services-led consumer model. To the extent that this implies a shift in the mix of GDP away from exceptionally rapid gains in investment and exports, toward relatively slower-growing internal private consumption, a slowdown in overall GDP growth is both inevitable and desirable. Perceptions of China’s vulnerability need to be considered in this context. This debate has a long history. I first caught a whiff of it back in the late 1990s, during the Asian financial crisis. From Thailand and Indonesia to South Korea and Taiwan, China was widely thought to be next. An October 1998 cover story in The Economist , vividly illustrated by a Chinese junk getting sucked into a powerful whirlpool, said it all. Yet nothing could have been further from the truth. When the dust settled on the virulent pan-regional contagion, the Chinese economy had barely skipped a beat. Real GDP growth slowed temporarily, to 7.7% in 1998-1999, before reaccelerating to 10.3% in the subsequent decade. China’s resilience during the Great Financial Crisis was equally telling. 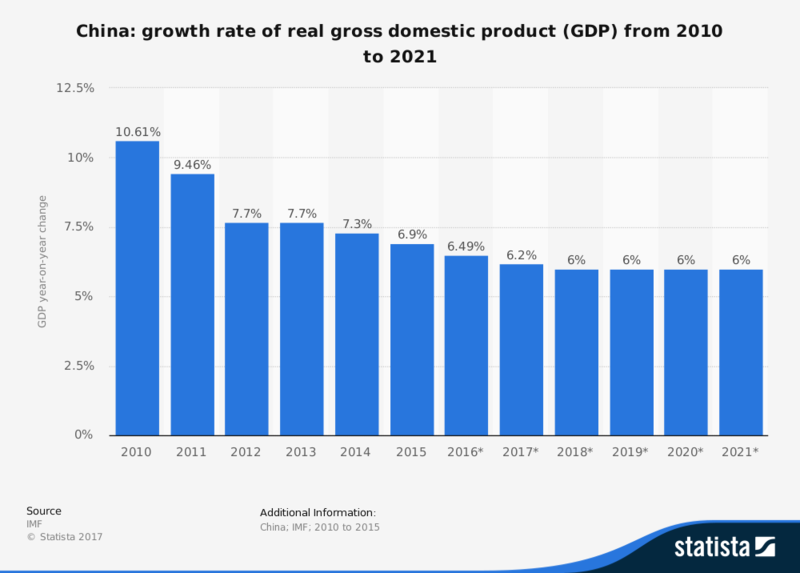 In the midst of the worst global contraction since the 1930s, the Chinese economy still expanded at a 9.4% average annual rate in 2008-2009. While down from the blistering, unsustainable 12.7% pace recorded during the three years prior to the crisis, this represented only a modest shortfall from the 30-year post-1980 trend of 10%. Indeed, were it not for China’s resilience in the depths of the recent crisis, world GDP would not have contracted by 0.1% in 2009, but would have plunged by 1.3% – the sharpest decline in global activity of the post-World War II era. The latest bout of pessimism over the Chinese economy has focused on the twin headwinds of deleveraging and a related tightening of the property market – in essence, a Japanese-like stagnation. Once more, the Western lens is out of focus. Like Japan, China is a high-saving econom y that owes its mounting debt largely to itself. Yet, if anything, China has more of a cushion than Japan to avoid sustainability problems. According to the International Monetary Fund, China’s national savings is likely to hit 45% of GDP in 2017, well above Japan’s 28% saving rate. Just as Japan, with its gross government debt at 239% of GDP, has been able to sidestep a sovereign debt crisis, China, with its far larger saving cushion and much smaller sovereign debt burden (49% of GDP), is in much better shape to avoid such an implosion. To be sure, there can be no mistaking China’s mounting corporate debt problem – with nonfinancial debt-to-GDP ratios hitting an estimated 157% of GDP in late 2016 (versus 102% in late 2008). This makes the imperatives of state-owned enterprise reform, where the bulk of rising indebtedness has been concentrated, all the more essential in the years ahead. Moreover, there is always good reason to worry about the Chinese property market. After all, a rising middle class needs affordable housing. With the urban share of China’s population rising from less than 20% in 1980 to more than 56% in 2016 – and most likely headed to 70% by 2030 – this is no trivial consideration. But this means that Chinese property markets – unlike those of other fully urbanized major economies – enjoy ample support from the demand side, with the urban population likely to remain on a 1-2% annualized growth trajectory over the next 10-15 years. With Chinese home prices up nearly 50% since 2005 – nearly five times the global norm (according to the Bank for International Settlements and IMF global housing watch ) – affordability is obviously a legitimate concern. The challenge for China is to manage prudently the growth in housing supply needed to satisfy the demand requirements of urbanization, without fostering excessive speculation and dangerous asset bubbles. Meanwhile the Chinese economy is also drawing support from strong sources of cyclical resilience in early 2017. The 11.3% year-on-year gain in exports recorded in June stands in sharp contrast with earlier years, which were adversely affected by a weaker post-crisis global recovery. Similarly, 10% annualized gains in inflation-adjusted retail sales through mid-2017 – about 45% faster than the 6.9% pace of overall GDP growth – reflect impressive growth in household incomes and the increasingly powerful (and possibly under-reported) impetus of e-commerce. Pessimists have long viewed the Chinese economy as they view their own economies – repeating a classic mistake that Yale historian Jonathan Spence’s seminal assessment warned of many years ago. The asset bubbles that broke Japan and the United States are widely presumed to pose the same threat in China. Likewise, China’s recent binge of debt-intensive economic growth is expected to have the same consequences as such episodes elsewhere. Forecasters find it difficult to resist superimposing the outcomes in major crisis-battered developed economies on China. That has been the wrong approach in the past; it is wrong again today.